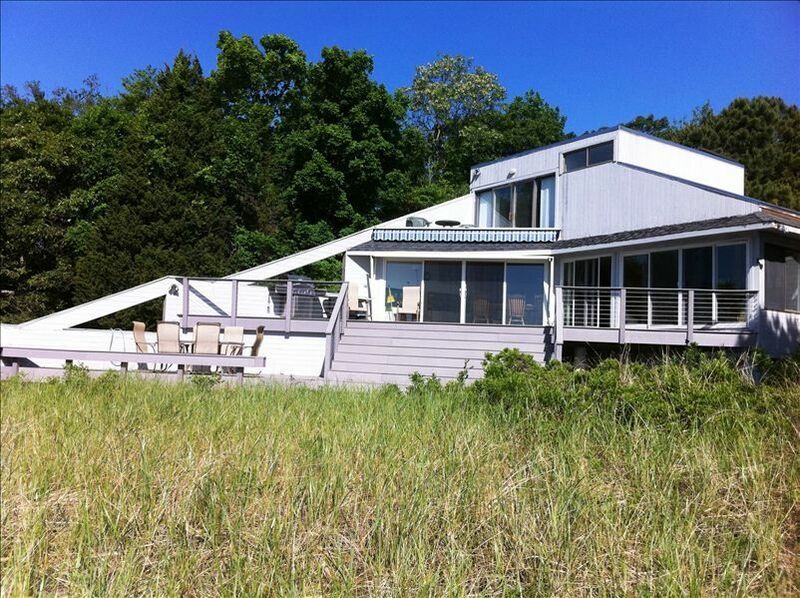 This spectacular contemporary overlooks a lovely sandy beach on the Great Peconic Bay. The house is situated on three tranquil wooded acres with over 200' of beachfront. The walls facing the beach are all glass, the floor plan is open, and everywhere the views are amazing. The house is built on five half levels, all designed to make the most of the view. At the very top is the Master Bedroom with a king bed and a private deck overlooking the bay. Down a short flight of stairs is the Master Bathroom with Jacuzzi tub/shower combination. Around the corner is an generous seating area with a new 42' flat screen TV, plus a breathtaking view of the bay. Walk down some wide carpeted (suitable for sitting on) steps to the main level with an open floor plan. The spacious living room area with gas fireplace is open to the kitchen and dining area, and they all open onto a huge deck overlooking the beach. New sectional furniture makes the most of the view, winter and summer. One more short flight of steps down brings you to ground level where there is a guest room with its own private bath, plus a full bath off the hall. Three more small bedrooms and a utility room (with washer and dryer) share the lowest level. The first bedroom has a queen bed, the blue room has two twin beds and the yellow room has one full-size bed. All the rooms have been freshly painted and new carpeting was installed last summer. Cooks love our kitchen! Small and efficient, it contains a refrigerator, 5 burner gas oven, a microwave and disposal and dishwasher. Stand at the sink and you look across the dining room table through the sliding glass doors to the deck and the beach and the bay. The large deck is accessible thru any of the sliding glass doors facing the bay. Spacious with plenty of seating, the deck has a roll-out awning for shade. There is a large gas grill to the side of the deck that can be used year round. A lower level has a table that comfortably seats six and can handle 8-10 people. The heat is forced hot air so becomes comfortable in minutes, and there is also central air conditioning although with the sea breezes you rarely need it. The cozy gas fireplace in the living room keeps the living area comfortable and is all the heat you need during the fall and spring. There is NO SMOKING permitted in the main house. Without written permission, pets are not permitted in the main house. The property is shared with a rental Cottage (vrbo.com/185625) which is set back from the Main House. NOTES: Rentals begin at 4:00 pm and end at 11:00 am. A 50% non-refundable deposit is required to secure a rental with the balance due 60 days ahead of the arrival date. We ask for a credit card on file for a $500 refundable security deposit. Keywords: Spectacular 5-level Contemporary Beachfront House, beach, privacy, spacious, great peconic bay, serenity, waterfront, open floor plan, stunning view, private beach, nature, north fork, vineyards, wineries, sandy beach. This property has been in my family for over ninety years. I spent summers here as a child, and have been fortunate enough to allow my five children to enjoy summers at the beach here as well. Now they're 24 to 34 and it's harder to assemble everyone, and harder for me to take time off from running my luxury Bed & Breakfast in Hanover, NH. We hope you enjoy our lovely beachfront home as much as we do. A peaceful, private and spectacular place to enjoy a weekend or extended rental with family and friends! We are right on a sandy beach on the Great Peconic Bay. Heavenly. Central air conditioning keeps the house cool on the few days when the sea breeze isn't enough. Propane forced hot air - two zones. Large stacked washing machine and dryer in the lower level. High speed wireless internet is available throughout the house and surrounding property. Full gourmet kitchen to suit the most serious chef! The Master Bedroom has a private deck overlooking the Bay. We provide a few kayaks and water toys for our guests to enjoy. Please always return them to under the big deck after use. Our deck has been upgraded and expanded and offers two levels of seating plus beautiful 16' wide steps in the center. There are several public and private golf courses within 15 minutes of our home. The house has several sets of stairs and is not wheelchair accessible. Great central spot to discover the Nork Fork Wine Country! The house was perfect for 5 couples for our three day New Year’s trip. Beautiful views and easy access to wineries, beaches, nature preserve. We even enjoyed a Polar Plunge at the house. Had everything we needed and expected. Location on water, close to wineries, large enough for all family members. My friends and I spent Thanksgiving in Meredith’s home and we had an amazing time. The house is huge and spacious and has everything you could possibly need. It’s right on the water and close to town. Very clean too. Meredith was a wonderful host and easy to coordinate with. Just perfect! The house faces the bay all glass sliders watching the sunrise each morning. Meredith has thought of everything There’s a lovely grill for cooking outside and the kitchen is well stocked . There are plenty of bedrooms and loft areas so everyone is comfortable. Right on the beach -we spent much of our day outside on the deck by the water and up closer to the house -with more than enough seating . Thank you for a lovely memory ! Looking forward to returning ! We are located on the North Fork of Long Island in the middle of wine country. For years, home-grown farm stands, fresh fish markets, and simple wineries were along the main road. Now you'll find elegant gourmet markets, cheese shops, homemade ice cream, and elegant coffee shops and bakeries within a few minutes drive.